Bowers & Wilkins has announced it is to bring its award-winning Zeppelin iPod dock to the masses, with the launch of the Zeppelin Mini. As the name would suggest, the Zeppelin Mini is a more compact version of the Zeppelin. 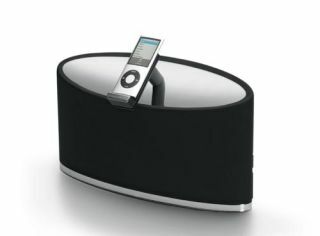 But B&W suggests, despite its size, the device "attains the same high standards in sound quality and design". New features to the dock include an updated docking arm and USB connectivity, while the device uses the same advanced Digital Signal Processing (DSP) that the Zeppelin uses. The ability to stream music to the dock is also present, but this can only be done via plain, old USB. The new compact size of the Zeppelin Mini is 200mm (height) by 100mm (depth), and it weighs in at just 2.5Kg. Interestingly, the new look for the system does mean that it doesn't look much like a zeppelin now, but there you go. The release date for the Bowers & Wilkins Zeppelin Mini is October, and it will retail for £299. Find out more by pointing your browser to www.bowers-wilkins.co.uk.